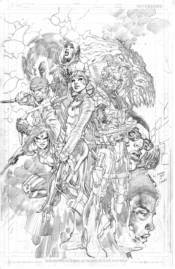 This fantastic new hardcover features Jim Lee's pencil artwork in its purest form! Harley Quinn. Deadshot. Killer Croc. Captain Boomerang. Enchantress. Katana. All deadly criminals sent on the most dangerous missions possible by a government that wants them killed. Their newest challenge? A teammate so powerful that even these murderers and thieves can't control him. Collects Suicide Squad April Fool's Special #1 and Suicide Squad #1-8.